Tom Pennington/Getty ImagesSister Jean was the hero of the NCAA Tournament, but NBA Twitter was still quick to take her to task after saying God was a college basketball fan. Sister Jean, the adorable team chaplain for the Loyola-Chicago Ramblers, said on Friday that she believed God preferred college basketball to the NBA, as the players weren’t there for financial gain. NBA fans and advocates for paid college players quickly turned on Sister Jean. Most jokes were good-natured, but the moment made clear that no one can stay a hero online for long. Sister Jean was the most beloved character of the NCAA Tournament, but her comments on Friday proved we’re all just one controversial take away from being roasted online. The 98-year-old chaplain for Loyola-Chicago had become a universally enjoyed figure during the Ramblers’ Cinderella run to the Final Four, a combination of gentle and genteel, that the collective internet had deemed as “Actually Good” – a rarity for these divisive times in which we live. Now, to be clear, Sister Jean likely had no idea the depth of the waters she was wading into – the heated online debate regarding player compensation in college sports has been raging for years. But regardless of her intention, Jean’s comments lighted a fire, and NBA Twitter was quick to pounce on the perceived misstep. Sister Jean Unleashed A Hot Take And NBA Fans Were Having Nun Of It. It’s not all that surprising that a 98-year-old woman of God would not be up to date on where fans land on the debate of paying college athletes. That said, many on Twitter are there to roast people, and roast they did. 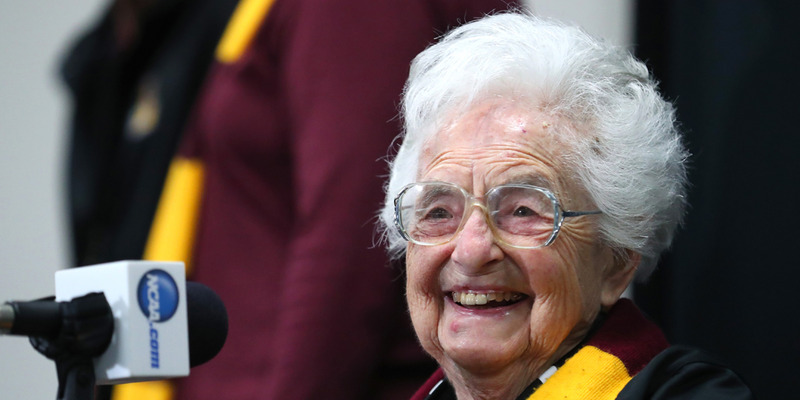 Sister Jean first came into our lives as the sweet, old chaplain for the Ramblers basketball team who just wanted to enter her March Madness brackets into a pool, but was stifled by the overbearing rule makers of the NCAA. Her celebrity grew as she corrected reporters on the degree of her fame, and even became a bobblehead. She is still, undeniably, an adorable, senior woman who loves her basketball. In small doses, like the clip below, she’s still the perfect character we all imagined when we first became aware of Sister Jean. We just made the mistake of asking for too much of a good thing. On the internet, everyone eventually becomes the villain, even Sister Jean. The Loyola-Chicago Ramblers face off against the Michigan Wolverines on Saturday with a spot in the national championship on the line.